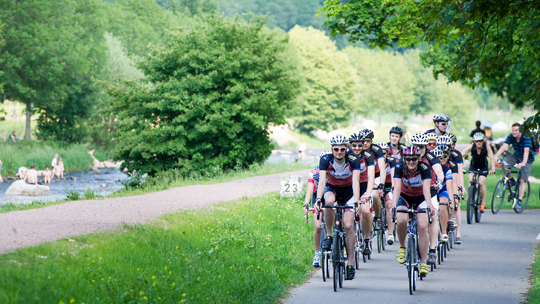 Karlsruhe, Strasbourg, Basel, Mulhouse and Freiburg: cyclists on this year’s Tour Eucor will be setting off from the five sites of the European Campus. And – like the athletes on the Tour de France – they are taking on a strenuous journey involving tough challenges. Literature scholar Prof. Dr. Andreas Gelz from the Department of Romance Languages and Literatures at the University of Freiburg is studying the heroization of athletes in French literature from the interwar era to date. Kerstin Ernst spoke with him about the Tour Eucor and the heroic tales of competitive cycling. Mr. Gelz, cyclists are now setting off from the five sites of the European Campus. What sort of heroic tales might there be from the Tour Eucor? Andreas Gelz: For the Tour Eucor I wouldn’t speak of a classic heroic tale, such as you might tell of a cycle race like the Tour de France. There, the top athletic performance, pushing bodies to their limits, the national territory and the process of creation of a collective identity come to the fore. These elements also play an important part in heroic tales. For the Tour Eucor the identity-defining dimension is instead the deliberate crossing of national borders. A key part of it is less about the contest than about cycling as a shared experience and the international exchange. 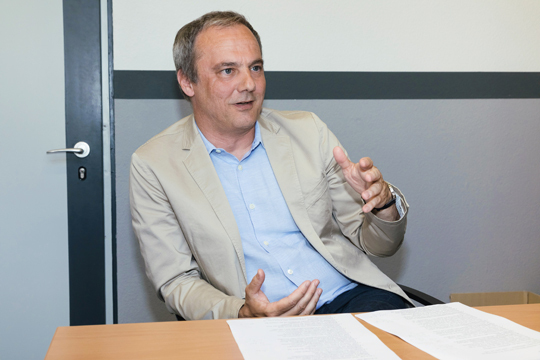 The spatial connection of the Upper Rhine sites of the university which is created by the journey is also intended to help build up a new sense of cross-border togetherness. But aren’t there also border crossings in classic competitive cycling? True, but they are more the exception to the rule. And they take place entirely against a political background: for instance, in 1965 the Tour de France started in Germany for the first time. The background to this was amongst other things the conclusion of the Franco-German Élysée Treaty of 1963. Traditionally, the essence of the Tour, which was established in 1903, was to truly experience France as a national area. For many years the stages followed the borders of the provinces, and between 1930 and 1968 national teams took part. Border crossings weren’t always an expression of international understanding. On the contrary, they were occasionally expressions of revenge: from 1906 to 1910, the Tour passed through Alsace and Lorraine which were annexed by Germany. So for the French this was also about a symbolic reappropriation of the occupied area. Deliberately transnational cycle races are rare – one example would be the Peace Race, which was the great competitive cycling event in Central Europe from 1948 until the Fall of the Wall. It ran through Poland, Czechoslovakia and the GDR. So what are the heroic tales in texts about competitive cycling like? In his 1950s book “Mythologies”, the French theoretician Roland Barthes wrote an essay that is often quoted: “The Tour de France as Epic”. In it he commented on its mythos and in particular its “Homeric geography”, the heroic struggle of the racing cyclists against their opponent personified in nature, the mountains, wind and rain. Many presentations of the Tour focus on specific heroic couples – Bartali versus Coppi, Anquetil versus Poulidor – or emphasize the combative sprints or the solo attempts of individual cyclists to distance themselves from the field. When did competitive cycling start to feature in French literature? As a literary endeavor, competitive cycling appears very early on, above all in the period between the World Wars. In the beginning, texts that were a hybrid of sports journalism and literature predominated. As a whole there is a large range of genres that deal with competitive cycling. One example is the coming-of-age novel, where an athlete from a poor background rises socially as a result of his success, but often also falls again. There are also autobiographical texts that trace the importance of competitive cycling in the lives of the authors. Especially thrilling are texts in which the authors and amateur cyclists first follow a particular Tour de France or Giro d’Italia beforehand, so that the cycle race is the material and the inspiration for writing. Interestingly there are also crime novels about competitive cycling. In these it appears as a symptom of negative aspects of society, for instance the subject of doping. Other genres include for example travel stories or philosophical texts, which deal amongst other things with questions of body image as well as with the category of freedom. What did the texts that looked at competitive cycling talk about? Between the First and Second World War, the contemporary connections of the texts were especially striking. One war had just ended, many stages of the Tour passed through the sites of former battles. Since roads were often not asphalted at this time, cyclists soon became very muddy and resembled soldiers from the front-line. For example, Albert Londres, a famous journalist, compared the cycling caps – which at the start of the race were colorful but gradually became coated in mud – with the bandages of injured soldiers. Religious metaphors such as the racing cyclist as a martyr, a figure on the Way of the Cross were also used. What literary depiction of competitive cycling most impressed you? I was most impressed by the text “Strafgefangene der Landstraße. Reportagen von der Tour de France” by Albert Londres, who accompanied the Tour in 1924 for a newspaper. In his fragmentary, sketch-like texts, he attempted to find new linguistic forms to capture the dynamic of competitive cycling in literature.